Experience the natural beauty of Western Canada and get out and about. In addition to relaxing sightseeing journeys, you’ll enjoy guided hiking in Jasper, gentle rafting on the Bow River, canoeing on Lake Louise, and more! Your choice of outdoor activity: a guided cycling tour of Vancouver’s highlights or a Zodiac tour on Howe Sound on the “Sea Safari”. The remainder of the day is yours to explore. Overnight in Vancouver. 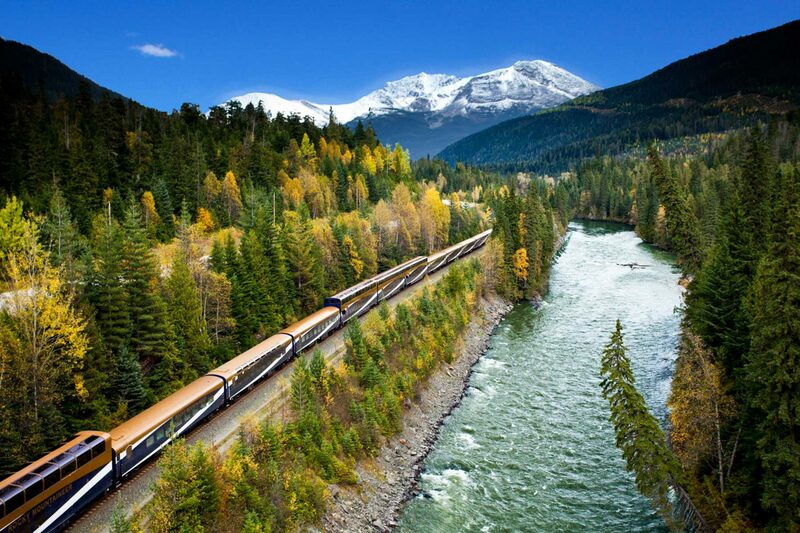 Onboard Rocky Mountaineer. Overnight in Jasper. Enjoy a scenic half-day tour of Jasper National Park. In the afternoon, enjoy a guided hike in the park. Overnight in Jasper. Travel along the Icefields Parkway to Lake Louise by motorcoach. Tour Athabasca Falls before arriving at the Columbia Icefield, where you will ride on an Ice Explorer. A brief stop will be made at Bow Lake. Overnight in Lake Louise. Enjoy the morning at leisure. After lunch, a motorcoach tour takes you into Yoho National Park. Attractions include the Spiral Tunnels, Emerald Lake, and more. The tour ends in Banff, where you will stay overnight. Your morning is free. Early this afternoon take a gentle raft float down the Bow River. The remainder of the day is at your leisure. Overnight in Banff. Surprise Corner, and the Hoodoos. Banff Gondola is included. Continue on to Kananaskis for a 12-minute Panoramic Helicopter Tour. Overnight in Calgary. Your Journey through the Clouds Outdoor Adventures journey ends with checkout from your Calgary hotel.